Thistledown is a thoroughbred race track in North Randall, Ohio at the outskirts of the city of Cleveland. It is owned by Magna Entertainment Corporation. The track came under the regulation of the Ohio Racing Commission in 1931 when it was formed. The track is the home of the Ohio Derby, the only graded stakes race in Ohio. The track races under the Ohio 7/7 Program which means that live racing is held at two locations in the state at the same time. During the summer Thistledown races seven races on a card and River Downs races the other seven. In September, Beulah Park takes over for River Downs. Ohio racing is dark January to March. The track has declined in recent years due to summertime competition and the lack of slot machines that neighboring tracks have. 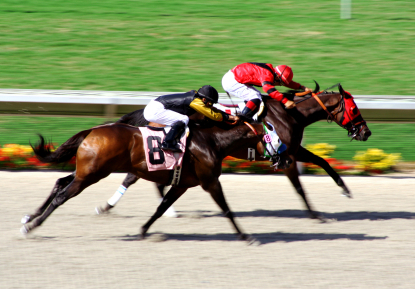 In 2007, Thistledown's parent company, Magna Entertainment, announced that the racetrack was for sale. As a result of staggering losses in which Magna Entertainment reported net losses of $87.4 million in 2006, $105.3 million in 2005 and $95.6 million in 2004, and has an accumulated deficit of $393.8 million as of March 31, 2007, Magna Entertainment stated: "Accordingly, the company's ability to continue as a going concern is in substantial doubt and is dependent on the company generating cash flows that are adequate to sustain the operations of the business, renew or extend current financing arrangements and maintain its obligations with respect to secured and unsecured creditors, none of which is assured...". Once-thriving Thistledown, which hosts the $300,000 Ohio Derby, posted a pretax loss of $4.5 million in 2006. The track has a one mile dirt oval. There is no turf course.